This study examine the effect of board stock ownership, board size, frequency of board meeting, and the independence of the board against the cost of debt (bonds). The population in this study is a bond that has a yield to maturity (t + 1) number in the period 2012-2016. The sample method used is purposive sampling. Methods of data analysis using multiple regression. The results of this research indicate that board stock ownership, board size, the frequency of meetings of the board, and the independence of the board does not affect the cost of debt (bond). The results of the first and second sensitivity test show that board stock ownership, board size, the frequency of meetings of the board, and the independence of the board do not affect the bond rating. The research finding show that the board of commissioners has not been able to contribute to the reduction in bond debt costs. The results of this study are in line with the phenomenon in Indonesia that there are only 4 public companies that entered the ASEAN 50 TOP award of the Asean Corporate Gorvenance Scorecard in 2017. These conditions illustrate that corporate governance in Indonesia is still weak.The results of this study are not able to support agency theory and theory of the firm. The results of this study can be used by OJK to improve the standards of the board. Ashbaugh-Skaife, H., Collins, D. W., & LaFond, R. (2006). The effects of corporate governance on firms’ credit ratings. Journal of Accounting and Economics, 42(1), 203-243. Ertugrul, M., & Hegde, S. (2008). Board compensation practices and agency costs of debt. Journal of Corporate Finance, 14(5), 512-531. Hartono, J. (2014). Metodologi Penelitian Bisnis Salah Kaprah dan Pengalaman - Pengalaman (6 ed.). Yogyakarta: BPFE. Jensen, M. C. (1993). The Modern Industrial Revolution, Exit, and the Failure of Internal Control Systems. The Journal of Finance, 48(3), 831-880. Juniarti, & Sentosa, A. A. (2009). Pengaruh Good Corporate Governance, Voluntary Disclosure terhadap Biaya Hutang (Costs of Debt). Jurnal Akuntansi dan Keuangan, 11(2), 83-99. Kennedy, J. C., & Landau, I. R. (1967). Recent Developments in Debt Financing and Corporate Trust Administration. The Business Lawyer, 353-374. Lorca, C., Sánchez, J. P., & Meca, B. G. (2011). Board Effectiveness and Cost of Debt. Journal of Business Ethics, 100(4), 613-631. Masri, I., & Martani, D. (2012). Pengaruh Tax Avoidance terhadap Cost of Debt. , 1-28. Paper presented at the Simposium Nasional Akuntansi XV, Banjarmasin. Nurfauziah, & Setyarini, A. F. (2004). Analisis Faktor-Faktor yang Mempengaruhi Yield Obligasi Perusahaan (Studi Kasus Pada Industri Perbankan dan Industri Finansial). Jurnal Siasat Bisnis, 2(9), 241-256. Piot, C., & Piera, F. M. (2007). Corporate governance, audit quality and the cost of debt financing of French listed companies. Paper presented at the Communication présentée au 28ème Congrès de l’Association Francophone de Comptabilité, Poitiers. Rebecca, Y., & Siregar, S. V. (2012). Pengaruh Corporate Governance Index, Kepemilikan Keluarga, dan Kepemilikan Institusional terhadap Biaya Ekuitas dan Biaya Utang: Studi Empiris pada Perusahaan Manufaktur yang Terdaftar di BEI. (Skripsi), Universitas Indonesia, Jakarta. Sengupta, P. (1998). Corporate Disclosure Quality and the Cost of Debt. The Accounting Review, 73(4), 459-474. Setyaningrum, D. (2005). Pengaruh Mekanisme Corporate Governance terhadap Peringkat Surat Utang Perusahaan di Indonesia. 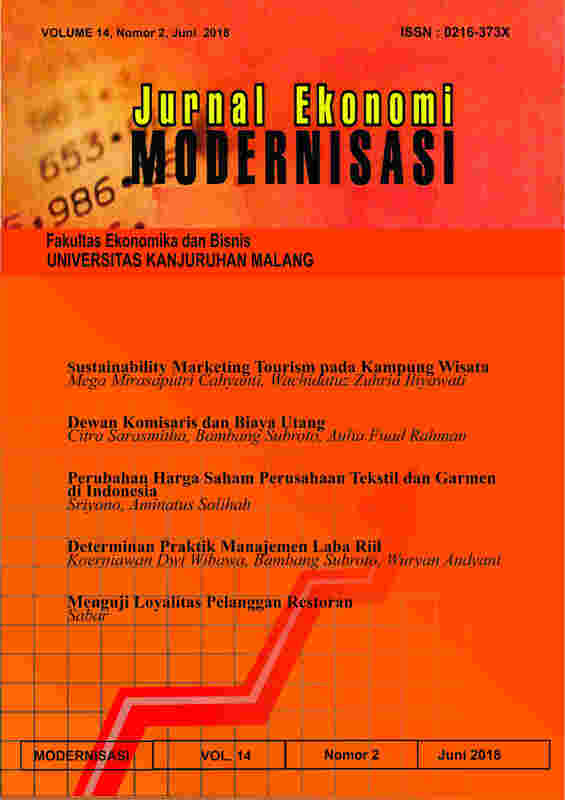 Jurnal Akuntansi dan Keuangan Indonesia., 2(2), 73-102. Sujoko, & Soebiantoro, U. (2007). Pengaruh Struktur Kepemilikan Saham, Leverage, Faktor Intern Dan Faktor Ekstern Terhadap Nilai Perusahaan (Studi empirik pada perusahaan manufaktur dan non manufaktur di Bursa Efek Jakarta). Jurnal Manajemen dan Kewirausahaan, 9(1), 41-48.